fiona as a day of the dead skeleton spider princess for halloween. i tried to tell her that she was just a day of the dead figure but she promptly corrected me. she tried to throw "cat" in there but i challenged her. and ultimately won. i had a lot of fun doing this makeup and making the crown. the day when she no longer needs me to help her with her costume will be the saddest day of all time. 32" red juju is $250 USD. available here. it's the same size as mine. mantel perfect. black, brown and natural 32" $250. available here. black, brown and natural (some cool spotted feathers in there too) 32" $250. available here. pink 21" $180. available here. i introduced some small jelly prints to my shop a few weeks ago and got some requests for large versions. ask and ye shall receive....now available 34 x 26 and 48 x 36. that's big ya'll. working on a commission for a public space was a first for me. and i honestly had no idea how it would turn out....most art you see in stores just looks blah. i think not here. that painting really draws you in. total USA-all-the-way colors but with a mercurial feel. 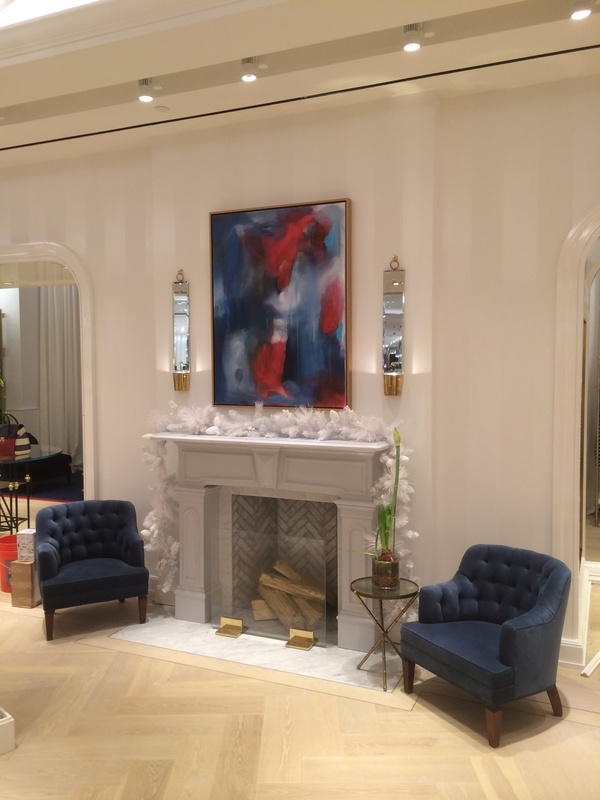 rob and connor at tommy hilfiger knew exactly how to use that painting to elevate the whole area. and i have to say that is not easy to do. i have seen some glorious paintings fall flat in a space which just makes me sad. ok then. you have things to buy. prints, juju hats...commissions. wink wink.